My brethren, if any among you strays from the truth, and one turns him back, let him know that he who turns a sinner from the error of his way will save his soul from death, and will cover a multitude of sins. Therefore, gird your minds for action; keep sober in spirit, fix your hope completely on the grace to be brought to you at the revelation of Jesus Christ. As obedient children, do not be conformed to the former lusts which were yours in your ignorance, but like the Holy One who called you, be holy yourselves also in all your behavior; because it is written, "You shall be holy, for I am holy." Therefore, my my beloved brethren, be steadfast, immovable, always abounding in the work of the Lord, knowing that your toil is not in vain in the Lord. "A SINGLE LIGHT CAN PROVIDE HOPE IN THE DARKEST NIGHT." Name the two sons of Moses. I don't tie neat knots when tying a new skein of yarn to my project. what do you suggest. I want my work to look neat but yet be strong . "There is no fear of judgment for the man who judges himself according to the word of God." Many crocheters don't use knots at all but I'm with you... I always tie knots! When I tie a knot in my work I take the right hand strand of yarn over the left, then the left hand strand over the right, then the right hand strand over the left again. This makes a sturdier knot. I've found if I take one strand over the other a couple of times then one strand will slip right off of the other. I like a knot that will stay in place! Don't forget to weave those yarn tails in, weaving in one direction for a couple inches and then in the opposite direction for a couple of inches will hold better. Hi! I have been (searching with no luck)a stitch called a( raised double crochet border) rdcb and a (crossed double crochet border)cdcb, and a fantasy stitch. I hope you can find them they sound interesting. Thank-you for your time. A Crossed Double Crochet is the same as a Crochet Cross Stitch. You normally skip a stitch, work a double in the next stitch, then back up and work a double in the skipped stitch. This "crosses" the two doubles. I haven't been able to find anything on a "fantasy stitch". To get alot more crocheting into your schedule... get projects ready ahead of time! I love to crochet while watching tv or waiting at a doctor visit. My main reason for not crocheting is because I don't have materials together for a project. Take time to go through your patterns and yarn stash. Get the materials together for several projects at once. Place materials for each project (hook, yarn, pattern, etc) in a separate tote bag and keep these where you are able to grab them quickly. Here I am, again. Has it been 5 years, already? I just received the newest letter this morning. I love your site and want to tell you that I never tire of it. In fact, this is one of the best that I could ever subscribe to. I also subscribe to Bev's Crochet. Bless both of you.....you do a wonderful job. You have met your calling... 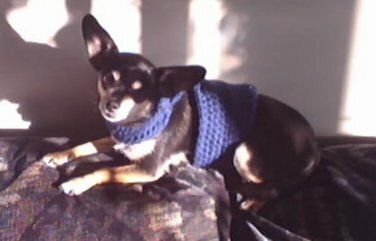 Your devoted fan, Lorraine Stanhope Bristol, CT.
Hi there: Here is a picture of my dog Coco wearing the dog sweater I saw on your web page. I chained 50 then joined them, row 2-12 stayed the same. Row 13 I did 10 slip stiches and 19 double stiches. Plus I used a G hook as well. 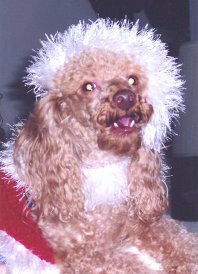 Hi, This is a picture of Jacques Que`bec, my red toy poodle on Christmas 2004. 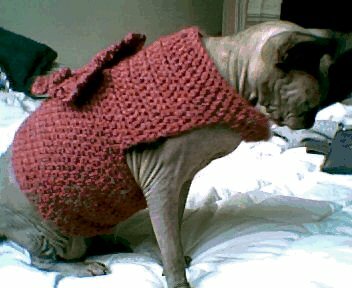 I CONVERTED your sweater pattern to knitting using Lion Brand's regular chenille yarn & the Fun Fur at the neck. I used Lion Brands pattern & instructions for the Santa Hat. Everyone who seen it thought it was fantastic. I even had people approach me in Home Depot asking if I sold them. This is a great website. I love the dog sweaters. They are awesome. a thing for sweaters, apparently. I couldn't help myself and crocheted a large flat flower and attached it to the back so looking down at her she looks very fancy. She loves it! 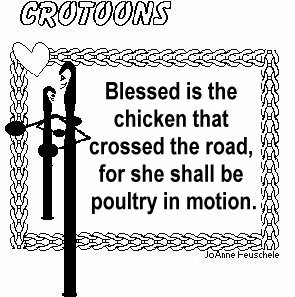 Here is a picture my friend just sent me for your Scratchin' Post webpage. The Instructions are in the April 15th issue. My son Mark was only 5 feet, 8 inches tall when he left for college in the fall. He worked through the Christmas holidays and didn't return home again until the February break. When he got off the plane, I was stunned at how much taller he looked. Measuring him at home, I discovered he now stood at 5 feet, 11 inches. My son was as surprised as I. "Couldn't you tell by your clothes that you'd grown?" I asked him. "Since I've been doing my own laundry," he replied, "I just figured everything had shrunk." Surgeons invited to dinner parties are often asked to carve the meat -- or worse yet, to watch the host carve while commenting on the surgeon's occupation. At one party, a surgeon friend was watching the carving while Harry, his host, kept up a running commentary: "How am I doing, doc? How do you like that technique? I'd make a pretty good surgeon, don't you think?" When the host finished and the slices of meat lay neatly on the serving platter, the surgeon spoke up: "Anybody can take them apart, Harry. Now lets see you put them back together again." A Sunday school teacher was telling the youngsters about Daniel and the Lions Den. She had a picture of Daniel standing, brave and confident, with a group of lions around him. One little girl started to cry. The teacher said, "Don't cry. The lions are not going to eat Daniel." The little girl said, "That's not what I'm crying about. That little lion, over in the corner, isn't going to get any food." A Sunday school teacher asked, "Johnny, do you think Noah did a lot of fishing when he was on the Ark?" "No," replied Johnny. "How could he, with just two worms." I must be following my diet too closely. I keep gaining on it.